Raila Odinga denied a chance to address during Madaraka event in Nyeri. Critics say, the President preached Unity, people took Discrimination. - Bana Kenya News, Real African Network Tubanane. Home featured Nairobi Raila Odinga denied a chance to address during Madaraka event in Nyeri. Critics say, the President preached Unity, people took Discrimination. Raila Odinga denied a chance to address during Madaraka event in Nyeri. Critics say, the President preached Unity, people took Discrimination. Raila Odinga was skipped in addressing people in the Madaraka day celebrations in Nyeri. The peace message that President Kenyatta preached at the Madaraka day celebrations went in Vain after the President snubbed the opposition leader to address the crowd. "His message of national unity just got lost by not even recognizing Raila, It was really bad of him, wish someone was to whisper to him that Ruto cannot acknowledge the presence of Raila as such the onus fell squarely on him." Meru Governor Peter Munya said. The crowd listened to speeches from several leaders but the presence of the NASA flag-bearer was not acknowledged by any of the leaders. The move was seen as a way of Uhuru refusing to give Raila a platform to address residents and Kenyans since he is his main competitor in the upcoming August elections. Despite the president preaching National Unity, it was seen a build up hatred among the Jubilee leaders who thought by giving him a chance will give the former prime minister mileage. "It would have been only fair and expected to acknowledge the presence of Immediate past Prime Minister and official opposition leader. For heaven's sake, it is a national event. Sadly this will now be the talking point." Said Mohammed Hersi. The people from Central are known for discrimination and being more tribalistic. Their human nature was seen today following the National day event in Nyeri county. 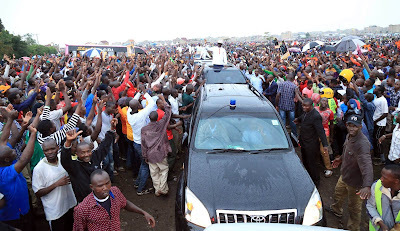 The Central leaders who claim to be preaching national unity only allowed the majority of people from their area to address the crowd and few individuals from outside the tribe led by DP William Ruto. Despite a struggle from the Ministry of sports to unite Kenyans in sports by organizing Gor and Nyeri combined match to mark unity, it was all in vain. The political temperatures were incited by the DP and President Uhuru Kenyatta move showing the Country is not one. Leaders across the country rebuked the incidence as inappropriate and it was artificial organized by the event organizers as well as the DP William Ruto.